Why do I feel qualified to write about this topic? 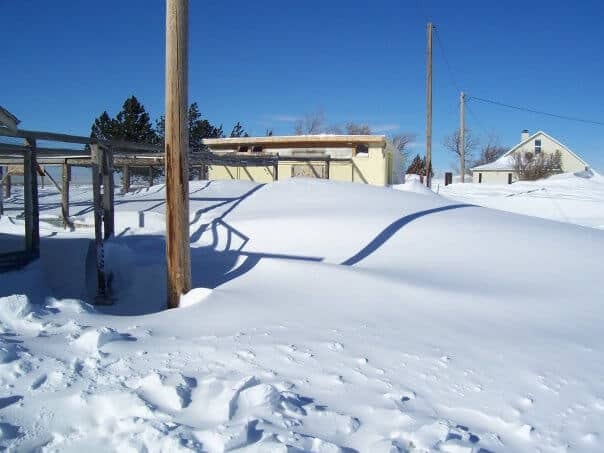 Living in Wyoming for the last 12 years has given me what feels like a PhD in “Homesteading in a Location with Insanely Crazy Winters”. 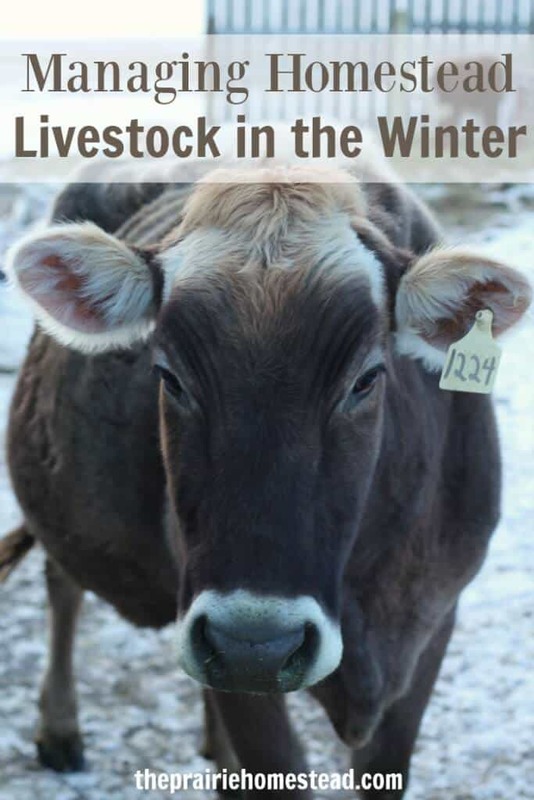 Now, I’m not complaining (well, just a little bit, maybe…), as I’m admittedly one of those crazy people who chooses to live in windy ol’ Wyoming, but learning to keep animals thriving during the dead of winter takes some special considerations. Let’s chat about those today. We don’t do a lot of extra fancy feeds during the winter, but we do make sure our animals have plenty of hay available at all times. 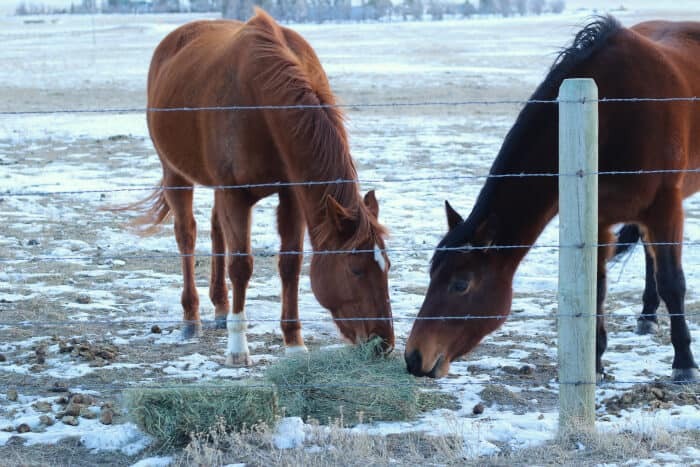 The process of digesting roughage helps keep horses and cattle warm, so it’s important they have plenty of roughage (hay) available to munch on throughout the day. While our cattle will pick at the pasture grass a bit during the winter, we don’t have enough land to support them all winter long, so we feed large round bales of grass hay during the winter. Don’t let the goats fool you… they aren’t stuck. Back in the day, we fed small square bales. However, getting a tractor has allowed us to feed large bales instead, which saves us a lot of work. Depending on how many animals we have at any given time, we have to put out a new bale about every 5-6 days. The main downside of feeding large bales is the amount of waste that is produced as the animals tromp on the hay, but it just comes with the territory (and goes in the compost pile). When I lock up Oakley the milk cow at night (I’m milking her once per day right now), I usually give her extra hay (or even some alfalfa hay) and sometimes grain since she needs more calories than our fat and sassy beef cattle. a) Ain’t nobody got time to do that multiple times per day, all winter long. Especially if you have larger animals who need many gallons at once. b) If you have to haul buckets, it’s easy to skimp on the water you’re providing, and the animals might not be getting as much as they need. We use a tank heater in our big stock tank. Yes, it uses electricity, but when the temps are below zero for weeks at a time, it’s near impossible to keep the tank from eventually freezing solid, even when you are chopping ice 2x/day. We use a heated dog bowl for our chickens. It needs to be refilled at least once per day, but it ensures they have access to water 24/7. If you absolutely can’t have electric water heaters, then invest in a good ax. 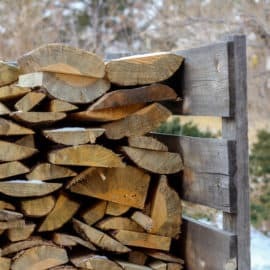 When it’s really cold, you’ll want to chop at least twice per day to ensure you stay on top of things. Depending on how thick the ice is, you might need to remove the big chunks so there is room for the fresh water. 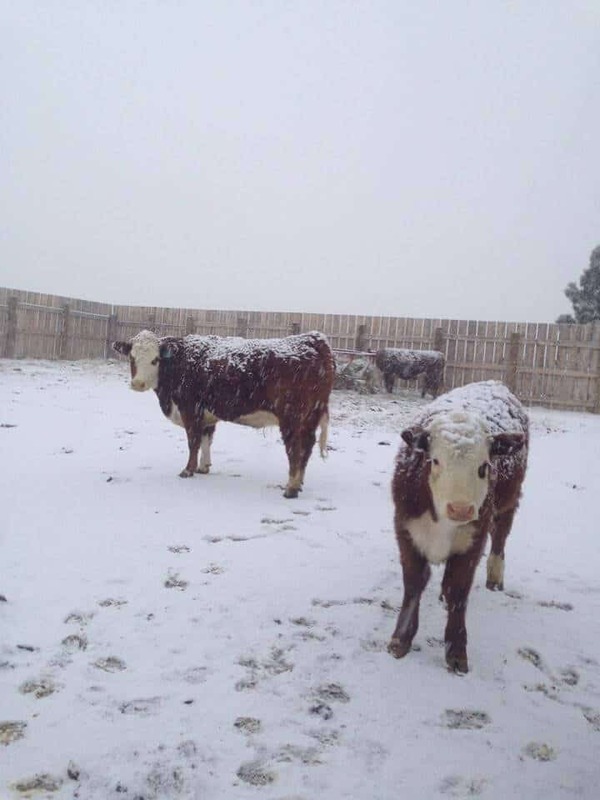 Sometimes when I post pictures of our winter homesteading efforts, someone will chastise me for not making sure all of our cattle have a barn to stand in. This always makes me giggle a bit, especially when I envision building barns for the thousands and thousands of cattle that call the Wyoming prairie home. That’s just not a possibility folks. However, the good news is that horses, cattle, goats, sheep, you name it, don’t have to have a barn to survive during the winter. They have the most amazing coats of hair designed to keep them warm and cozy in freezing temps. 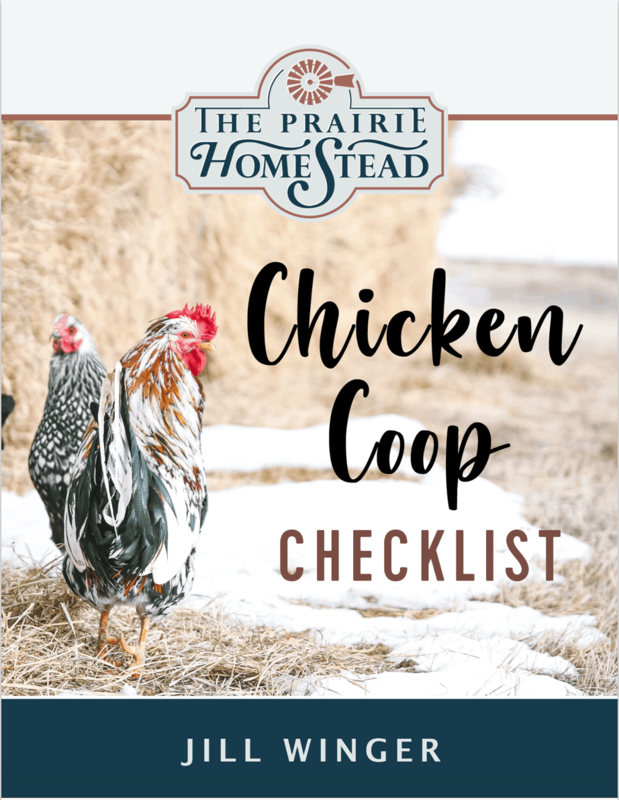 The chickens are allowed to go outside in the winter, but they usually opt to stay inside… Especially when the snow is piling up. We do have a barn with room for *most* of our critters, so sometimes I’ll open it up during the worst storms. It just makes me feel better when the wind is whipping snow around outside, but it’s not a requirement. Now it’s a little different when it comes to chickens. They do need some kind of shelter and a place to roost, but it may not need to be heated. 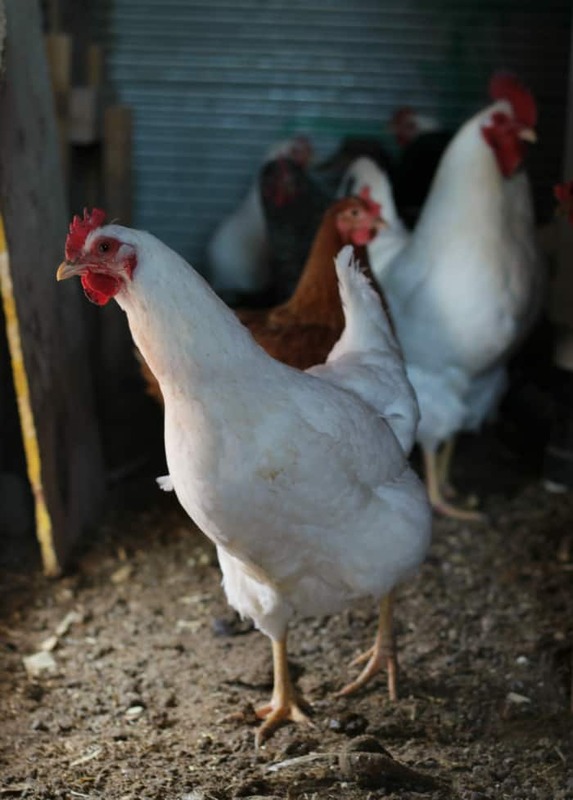 Here’s my post and opinions on the topic of heat lamps for chickens. What IS a requirement when it comes to shelter? Lots of hay to eat, and if you live in a very windy place, you’ll want some sort of windbreak. Cold temperatures are tolerable for critters (even very cold temps) as long as they have some way to get out of the wind. 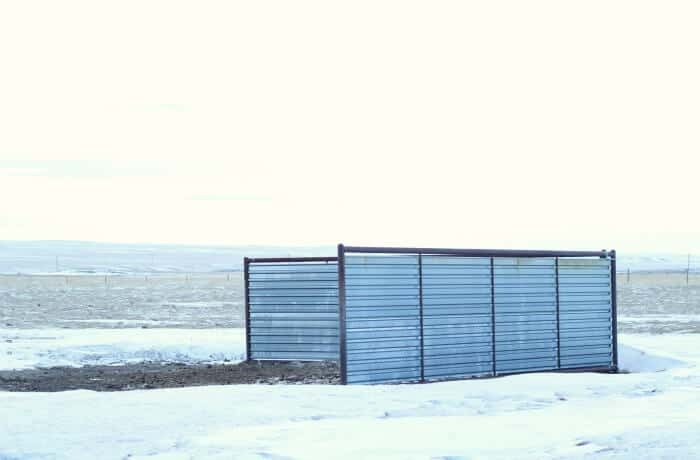 Windbreaks can be natural (like trees or the lay of the land) or man-made (like steel panels or wooden fences). Just make sure they have some way to escape the raging winds. We use these steel panels in our lower pasture and you will ALWAYS find the horses or cattle standing next to them during the worst storms. The wind here always comes from either the north or west, so we positioned these accordingly. 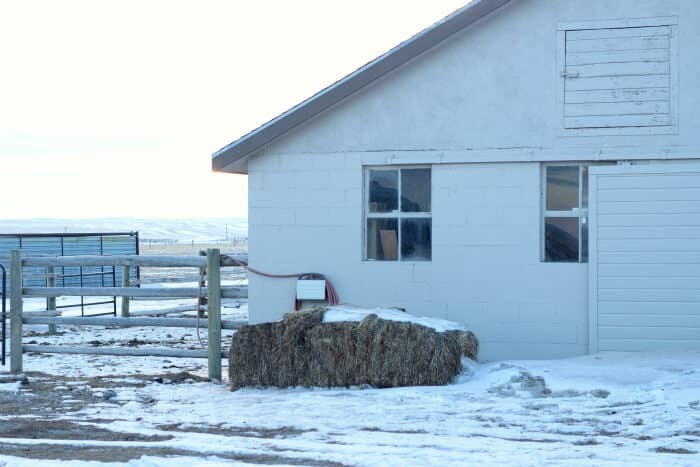 We built wooden windbreaks into our main winter corral (see the above photo with the cows and feeder). We keep our cattle in this pen during a majority of the winter (to allow our pastures to rest) and the wooden panels provide ample shelter. Don’t forget to keep your salt and mineral feeders full during winter. For some reason, it’s always easier for me to forget to check them during the winter months, but the animals still need the salt and nutrients. If you’re using hoses to water, drain them every. single. time. 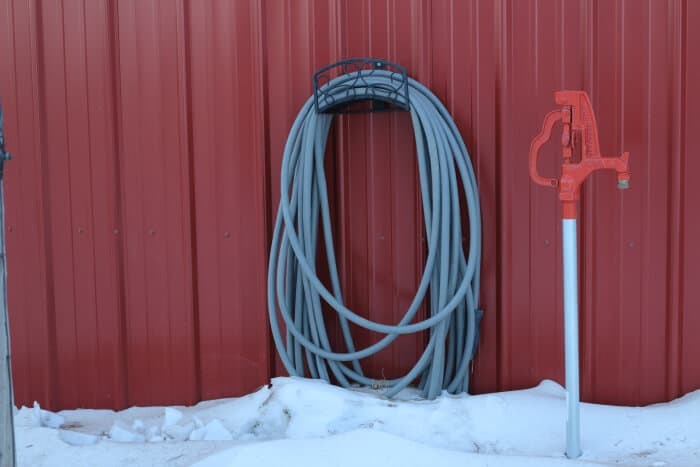 Otherwise you’ll end up with a pile of dripping, thawing hose in your mudroom and it makes a mess. Ask me how I know. 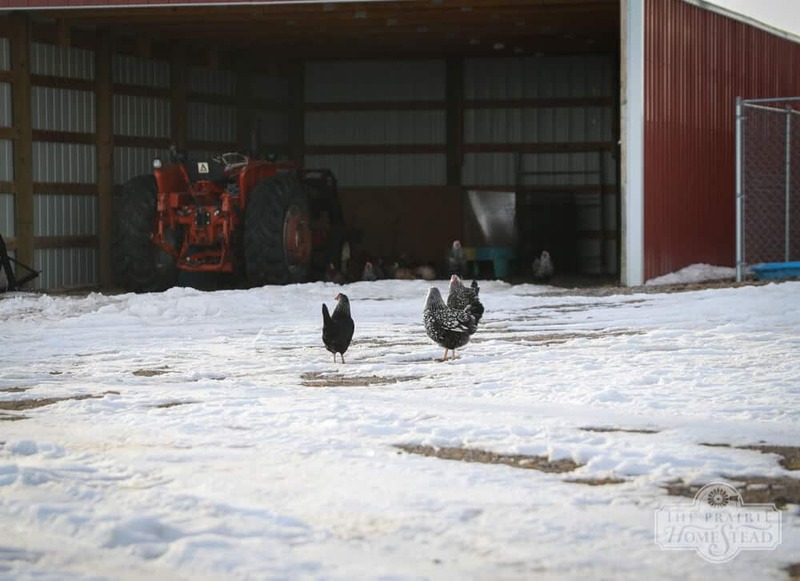 Clean the barn as much as you can when temperatures are above freezing. Because when the cold snaps come, having mountains of poop you can’t scoop will drive you slightly batty. Ahem. Invest in the right clothes. Because you’ll do a better job of completing chores when you can feel your fingers and legs. This post has the scoop on my favorite winter gear items. This was great and much needed!! Thank you! 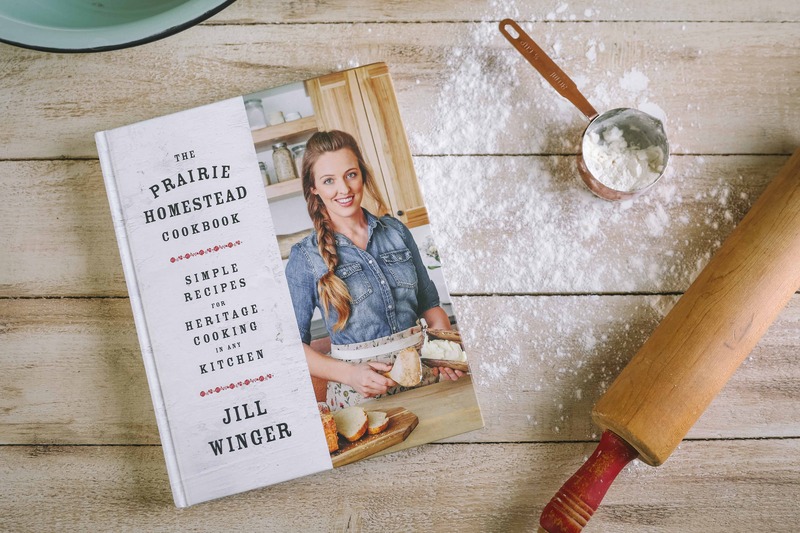 Hi Jill Great Article. I am way north of you near Edmonton Alberta and we get Northwesterly cold winds too ,so I guess they keep going down your way :0). My husband grew up on the prairies and was a trapper North of here for some time so he DOES winter. We have bees that even survive through these forbidding winter temperatures which always amazes me, coming from coastal BC. There is even the benefit that intestinal parasites and skin parasites cannot survive the cold winter here. In any case I just wanted you to know that I appreciate your website and it ALWAYS cheers me up to hear about your enthusiastic pioneering and your young family. Oh yes– you definitely know what cold is up there! 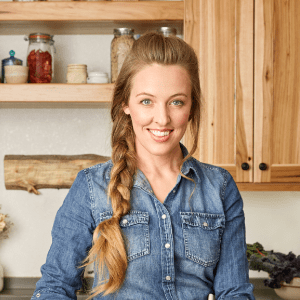 So glad you’ve been enjoying the blog! Thanks Jill! There are city people that thing if we feel cold outside, then the animals feel cold outside. We don’t have fur, and we don’t have the metabolism of animals who normally live outside. Our chickens, for example, have a coop with little heat except for that which they produce themselves. Normal temp inside is around -10C to -15C in winter. 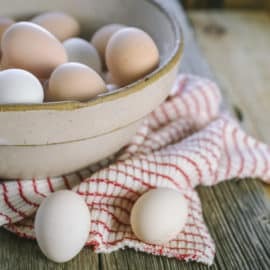 Egg production is near normal, and they do not huddle around the small heat source when it is on. Our dog is part wolf, and she just furs up for winter and stays outside except for short inside visits in the evening in the middle of winter. After about 1/2 hour inside, she goes to the door and asks to be let out. -25C is not unusual mid-winter, and she would rather be outside than inside with us. Unless you have dealt with real winters and animals, you do not know what they are capable of and how they survive that which would kill us. A few simple rules, such as lots of feed and water, and a place out of the wind, is pretty much all they need! Thanks again from Central BC, Canada. We live in Maine and keep the water tanks open for our horses and sheep using 2 different methods. Our House is off the grid so there is no electricity to power heaters. We keep the water clear for our small flock of sheep with an insulated 2 bucket holder I made using some scrap plywood and foam insulation. The holder is designed to accept two 5 gallon pails. Of the 2 buckets one is open, the other has a lid on it. At morning and evening feeding I carry one 5 gallon pail of hot water, with a lid, out to the barn and exchange it with the bucket that has been open for the ewes to drink from. The other bucket in the holder is the hot water I carried out to the barn the prior feeding and had left the lid on, I then remove the lid from the bucket with the now cool water and set the covered hot water pail in the holder next to it leaving the pail cover to act as the heater to keep the open pail from freezing. The hot water keeps everything from freezing even on very cold nights. 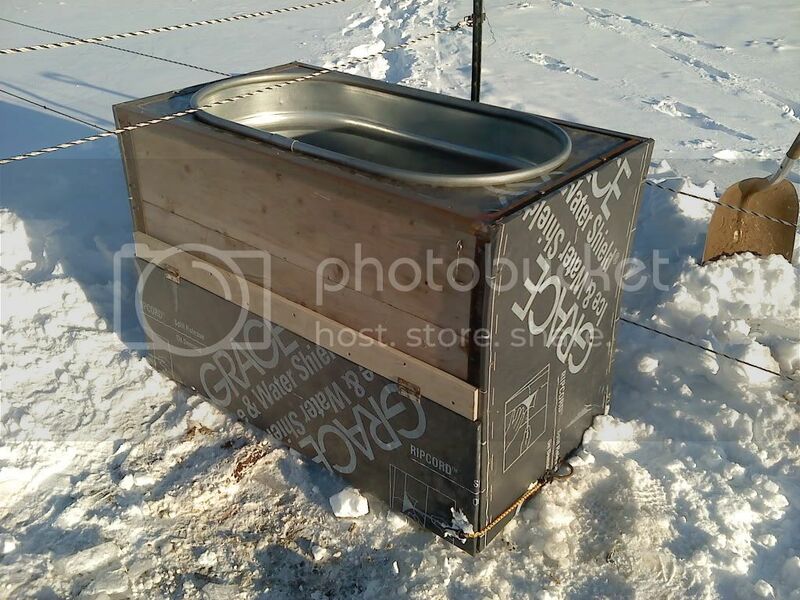 I don’t have a picture of it but it is simply an insulated box with 2 holes in the top of it. That is what works for us, hope it helps someone. Very cool! Thanks for sharing Billy!! 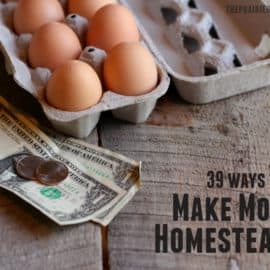 While I don’t have a large homestead (yet! ), I do have a start with my garden, greenhouse, and Rabbits! We moved the rabbit hutches into the greenhouse when the temps started really dropping and the wind started coming up (I’m in Colorado so we get the leftovers of your Wyoming wind lol). We keep a couple of small heaters running at night in the greenhouse and make sure there is plenty of straw in the hutches to bed down in. The heaters are just to make sure the water bottles don’t freeze up, not so much for comfort. During the day we turn off the heaters and many times open up the greenhouse doors. My rabbits are very happy in the colder weather out of the wind. I had wondered how people handle the bitter cold for their critters. I live in mississippi, so we literally don’t have to worry about it much. For my small chicken tractors, I use a ceramic bowl as a base and a plastic bowl as a liner to hold water. I didn’t build these tractors like any I’d seen online. I made basic cages with a roost, and nests. I put a tarp around them if it’s cold or raining. Otherwise, they’re open wire. These are in the pasture, feeding grass and fertilizing the grass. Great article! 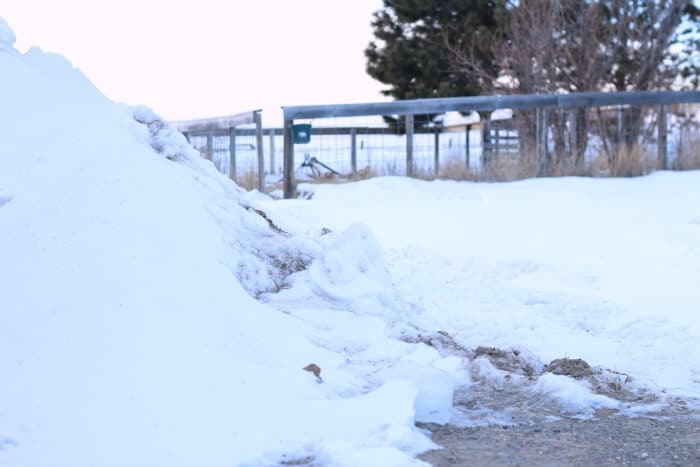 We don’t get nearly as cold as Wyoming (we’re in the PNW), but we do get cold spurts and I’m always amazed how the cows *prefer* to be out when the weather is the nastiest. We had freezing rain a few weeks ago and came out in the morning and they all had 1″ of ice covering their backs…. 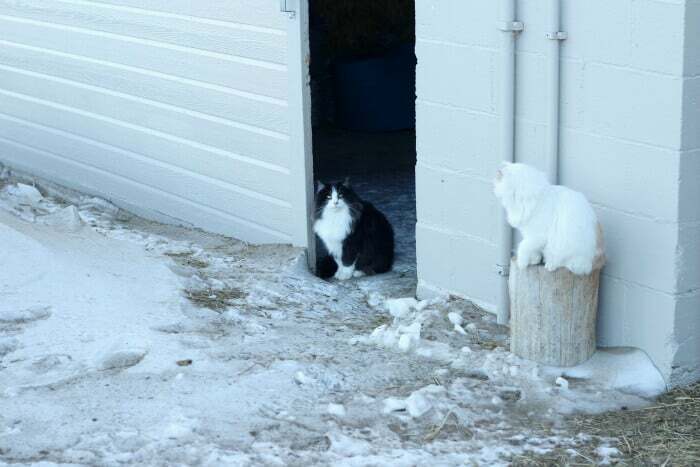 meanwhile, they have a nice barn, completely protected from the elements that they can go in anytime they please. 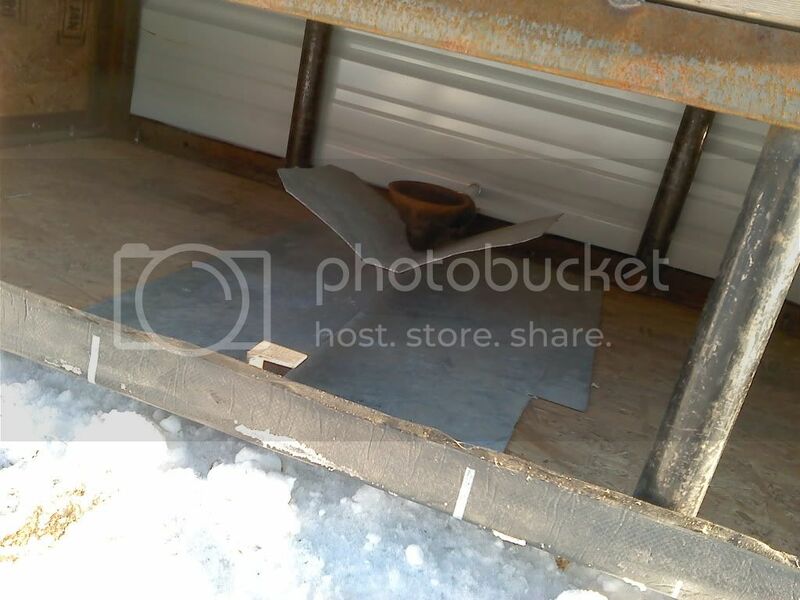 Our chicken & duck coops have automatic waterers inside (fully insulated) with heat tape around the pipes in case the coop temp drops below freezing. This has worked well to keep the water flowing. Plenty of bedding and never letting them run out of food seems to keep everybody happy & healthy all winter long! Yes, it’s amazing how tough they truly are, isn’t it? Great information. You are absolutely the expert when it comes to winter – poor you! As always, I enjoyed reading your blog. I was especially heartened to see that we were going to learn how to keep our water hydrant from freezing up since ours froze up on Sunday and we’ve been hauling buckets ever since. Alas, no such info! Other than waiting for the spring thaw, do you have any magical tricks in your arsenal of knowledge? Thank you, my dear. Stumbling upon your blog has been serendipitous for me. Staying warm (ha!) in Wisconsin. With our older faucets, I’ve found we MUST faithfully remove the hoses every single time we use them, so the water drains out thoroughly. IF you are still having problems, it could be that the weep hole at the very bottom of the hydrant isn’t working probably. This can cause the ground to saturate and then everything freezes up. (been there, done that). Hope that helps! Could you share the solution to this, because we struggle with the problem despite the hydrant being INSIDE the barn. Sounds like the weep hole at the bottom of the faucet might be plugged/not working properly which doesn’t allow the water to drain out or saturates the ground and causes it to freeze up. We’ve had that problem before too. Oh, I forgot to say, there is no hose attached to my frozen hydrant, so it’s not about draining the hose. It cost a WHACK of money & effort to get that hydrant in there & I am MAD every night that I have to haul pails from the house. Thanks for your insights each week, and your dedication to sharing them. I have learned a lot from your posts. Put a couple sq. 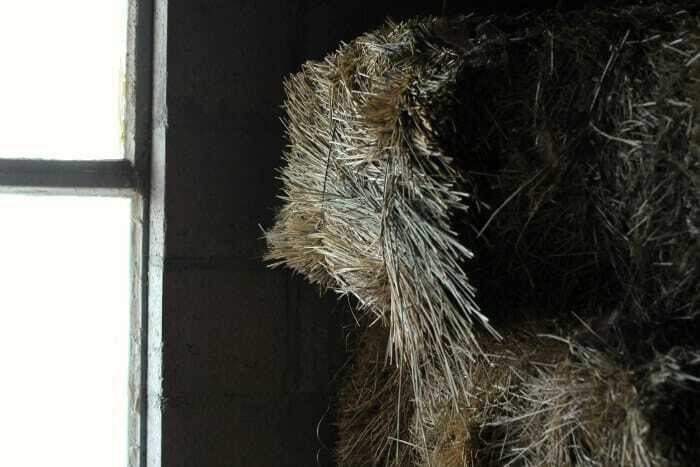 bales of straw\ hay around your frost free faucet. Most of the time the line will freeze at ground level. I’ve also used two old tires placed over the line/frost free faucet…packed full of straw/hay. Works for me in NE. Mo. Winter season is a very challenging season specially for elderly horses. Hi jill, how do you transition your calves to going outside on grass from being in a barn environment? Brrrrrrrrrrr ??????. I was looking at the picture of your goats. One of them looks like a Nubian? We have a herd of Nubian goats and plan to move to North Idaho where they get snow. I heard that Nubian goats don’t handle colder weather well. What are your thoughts on that? We live in south Texas presently so the temperatures are higher and we hardly ever get snow. I don’t want to leave my family of sweeties, so hope the harsh winters won’t be a big problem. While I have not had goats since moving to north Idaho, I did have a couple of Nubians in the Sierra Nevada mountains of northern California. The goats were definitely prima donnas when it came to the snow on the ground, they would look out of their goat house door in the morning (I locked them in at night because of the mountain lion problem), and say, “ain’t going out there! 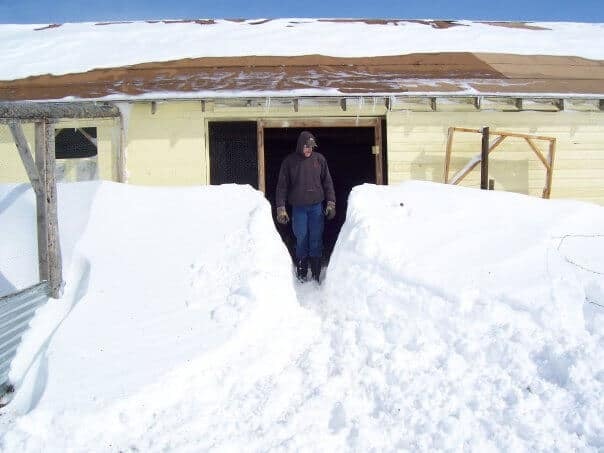 No way!” I know it was not as cold down there, nor did it stay cold for as long, but like Jill says, make sure they have plenty of hay and fresh ice free water and in the case of the goats, a shelter with hay or straw bedding, and they will acclimate and do just fine. Love your articles! We also love visiting Wyoming and I wish that we would live there! Many Many years ago when I was in my 20’s, I inherited chickens from my grand dad when he passed away. I had promised him if he died I would look out for them. I didn’t know anything about chickens and there was no internet so I just kept using what was already there. I had no idea that in our freezing New England weather the water bowl would freeze or that there might be a heated version. I do not know how those chickens flourished so well during freezing weather. I never lost one. I would love to have chickens again, and thanks to this post, hopefully I will have happier chickens. Thank you for your postings. 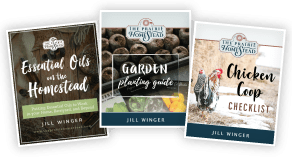 I’ve been a wanna be farmer for years and enjoy reading and learning from you. 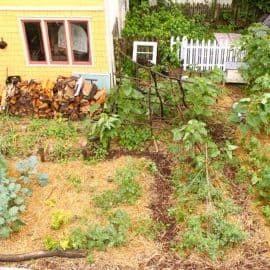 I’m hoping to have chickens, goats and pigs beside our beehive one day. Happy Everything To You Always! I really appreciate your blog and have been enjoying it immensely! My husband and I live in south-central Montana so our winters are pretty close to Wyoming’s. We have horses and have never blanketed them and we do not have a barn. 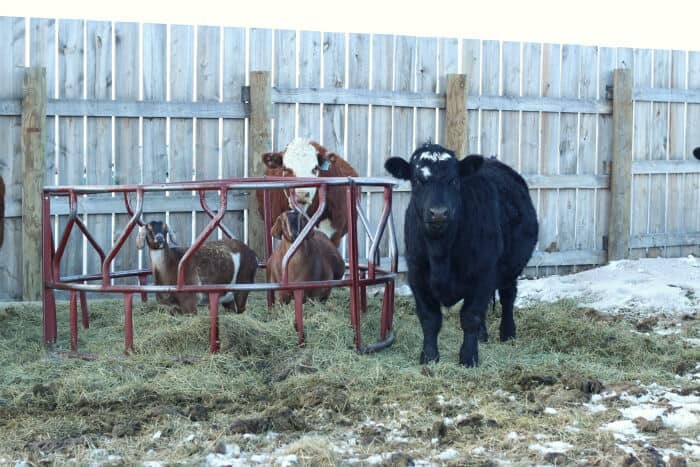 We do the same that you do, we have a run-in for wind shelter and we feed them more than in the winter, adding alfalfa or grains to their diet. We have been using a heater in our water tank. This year we built a box around it and over most of the top of it and added insulation to help keep the electric bill down some since we don’t have to run the heater all of the time now. I have gotten the same comments from “city” people or those from a warmer climate that they worry about our horses because we don’t keep them warm but we’d actually be doing them a disservice by not allowing nature to do its work. How do they think wild horses survive? They eat snow for water and forage for food so ours actually have it good. Thank you again for your blog, lots of great information. I really enjoy reading your blog. Very helpful. 1). Ever try one of those hoses that shrink up tight when there is no water in them? That way the water doesn’t freeze inside when not in use. 2) You mentioned a heated dog dish you change daily for your chickens. I have a 2 or 3 (I can’t remember) gallon water container that you plug in the base. With 6 chickens I change it 1-2 times per week. After about 4 days I tip it to one side, out of their coop, and empty the base and let it fill back up to refresh it.